Donald Trump’s recent accusations of “large scale voter fraud” and “rigged” elections are highly unlikely, according to multiple campaign experts interviewed by the News4 I-Team. The District’s Board of Elections released a document detailing cybersecurity precautions D.C. is taking to prevent hacking and cheating, which include beefed up firewalls, encryption software and monitoring systems to track internal IP addresses each time someone tries to access any of its databases. Maryland officials released similar documents detailing the different security procedures they’ve put into place to prevent what happened in Illinois and Arizona after foreign hackers infiltrated their voter registration databases and how they plan to prevent voter fraud at the ballot box. Maryland will use paper ballots that will be scanned into removable USB memory drives, a spokeswoman explained. But they’ve installed multilayered security procedures to prevent anyone from using a phony USB drive to alter the results, she explained. Both Maryland and Virginia stressed their ballot boxes are never connected to the internet, so no one could “hack” into their machines. The District’s Board of Elections said it hasn’t received a single complaint of voter fraud since the last general election. 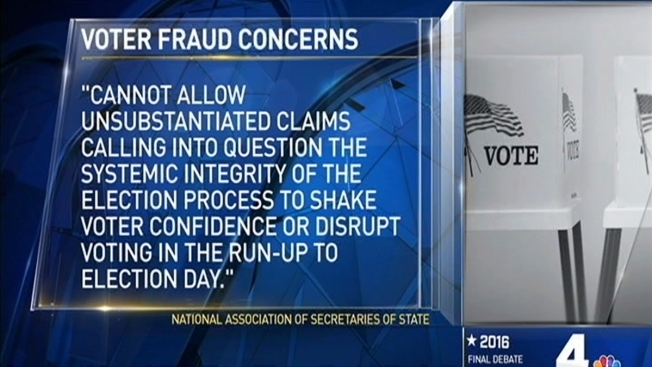 When voter fraud really does happen, it’s been limited to single individuals, Maryland’s Board of Elections told the I-Team. Maryland’s most recent case involved a woman who pleaded guilty to voting twice in Frederick County – once as herself and once using her mother’s absentee ballot during the 2012 election.